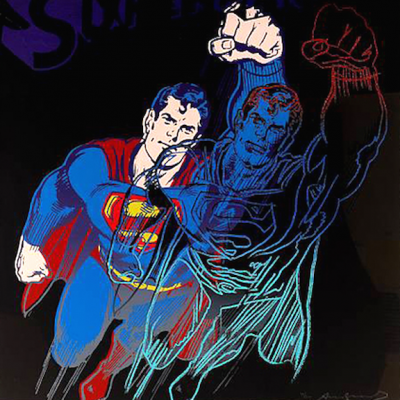 Stamped in black on the verso: "© Andy Warhol 1981 Publisher: Ronald Feldman Fine Arts, Inc. New York; © D.C. Comics, Inc. 1981 This interpretation created by Andy Warhol is derived from an original version of Superman copyrighted by D.C. Comics." Frayda Feldman and Jorg Schellmann, Andy Warhol Prints: A Catalogue Raisonne: 1962-1987, Fourth Edition, D.A.P., New York, 2003, Catalogue Reference F&S II. 260, another impression reproduced page 122 in color.